Earlier this week YouTube launched a new feature for non-profit organizations called “Call to Action”, allowing these organizations to place special overlay ads on their videos free of charge. These overlays can direct viewers to the non-profits’ homepage, where users can elect to donate money, sign up for mailing lists, and interact with other members in the community. And unlike typical ads on YouTube (which video uploaders don’t generally have control over), non-profits can specifiy exactly which page they’d like to redirect to. To pilot test the feature, YouTube placed a video supporting charity:water on its homepage last Sunday, featuring an overlay encouraging YouTube users to donate money to the cause. 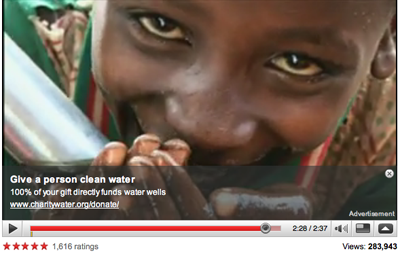 In that one day, charity:water received a whopping $10,000 from YouTube viewers. Granted, the fact that the video was featured on the homepage clearly had a huge impact on the turnout, but the success of the new Call-to-Action ads is likely going to be a boon for many non-profits. Also worth noting is that this is another step in YouTube’s shift towards allowing major YouTube partners to place their own ads on the content they own (before now ads have typically been contextual and sold and served by YouTube). In January we reported that YouTube was quietly rolling the feature out to major content partners, and it wouldn’t be surprising if YouTube extends the powerful feature beyond brands and charities to start including celebrities and politicians, too.